Observation-based studies have shown that the aerosol cloud lifetime effect or the increase of cloud liquid water with increased aerosol loading may have been overestimated in climate models. Here, by simulating the same shallow, warm clouds using a global climate model (CAM5) and a cloud resolving model (CRM) which has more complete and detailed cloud physics, we show how a climate model can overestimate the aerosol cloud lifetime effect due to its simplified representation of cloud processes. This paper evaluates the effectiveness of emission control measures implemented in Beijing during the Parade Blue period by integrating our own results, official-released data and modeling data. We demonstrate that emission control measures make a major contribution to air quality improvement in Beijing and surrounding regions. We conclude a joint local and regional control of secondary aerosol precursors to be key to curbing air pollution in Beijing. The exchange of carbon dioxide between the land biosphere in New Zealand and the atmosphere is estimated by combining measurements of the concentration of the gas in the air with model simulations of atmospheric circulation. The results indicate that over the study period of 2011–2013, New Zealand is a larger net sink for CO2 than estimated in the National Inventory Report. Regions in the western South Island, especially those covered predominantly by forests, contribute the most to this signal. An annual simulation of secondary organic aerosol (SOA) concentrations in China with updated SOA formation pathways reveals that SOA can be a significant contributor to PM2.5 in major urban areas. Summer SOA is dominated by emissions from biogenic sources, while winter SOA is dominated by anthropogenic emissions such as alkanes and aromatic compounds. Reactive surface uptake of dicarbonyls throughout the year and isoprene epoxides in summer is the most important contributor. In this study we present the offline-AMS source apportionment of the submicron organic aerosol (OA) sources conducted over 1 year at three locations in the south east Baltic region, which has so far received small attention. Offline-AMS enabled broadening the AMS spatial and temporal coverage, and provided a full characterization of the OA sources. Source apportionment results revealed that biomass burning and biogenic secondary emissions were the major OA sources during winter and summer. We studied the formation and properties of secondary organic aerosol produced from isoprene. We find that a significant fraction (~50 %) of the mass is composed of low-volatility, highly oxidized compounds such as C5H12O6. A significant fraction of the remainder appears to be in the form of oligomeric material. Adding NOx maintained or decreased SOA yields while increasing the fraction of low-volatility material, possibly due to oligomers. Concentrations of chemically and size-resolved submicron aerosol particles along with concentrations of gases and meteorological variables were measured at Santorini and Finokalia (central and southern Aegean Sea) during the Etesians. Particle nucleation bursts were recorded. The NPF can double CCN number (at 0.1 % supersaturation), but the resulting strong competition for water vapor in cloudy updrafts decreases maximum supersaturation by 14 % and augments the potential droplet number by 12 %. This study presents first ship-borne measurements of trace gases over the Bay of Bengal during summer monsoon. The observed variations in trace gases are shown to be due to dynamics/transport and en route photochemistry. Analysis of meteorological and chemical fields shows that significantly lower ozone during rainfall is associated with the downdrafts. A regional model reproduces the observed variations and revealed the rapid transport of ozone across the Bay of Bengal during an event. We investigate the particle size distribution and spectral optical properties of brown carbon (BrC) associated with the formation of secondary aerosol in the ambient atmosphere and relate these properties to major aerosol chemical components. We found that BrC occurs in particles in the droplet mode size range, enriched in ammonium nitrate and poor in black carbon (BC), with a strong dependance on the organic aerosol to BC ratio. We use a chemical transport model to examine how organic compounds in the atmosphere interact with water present in particles. Organic compounds themselves lead to water uptake, and organic compounds interact with water associated with inorganic compounds in the rural southeast atmosphere. Including interactions of organic compounds with water requires a treatment of nonideality to more accurately represent aerosol observations during the Southern Oxidant and Aerosol Study (SOAS) 2013. We present new sea surface and marine boundary layer measurements of carbonyl sulfide, the most abundant sulfur gas in the atmosphere, and calculate an oceanic emission estimate. Our results imply that oceanic emissions are very unlikely to account for the missing source in the atmospheric budget that is currently discussed for OCS. In this paper we present the corrosion/soiling results obtained from the analysis of different kind of materials that were exposed in Athens during the period 2003–2012. According to these results, the corrosion/soiling of the particular exposed materials tend to decrease over the years, except for the case of copper. Based on this long experimental database, applicable to multi-pollutant situation of the Athens basin, we present newly developed dose–response functions (DRFs). Exposure to mercury (Hg), is a significant issue from a human health perspective. Understanding the chemistry that leads to exposure is important. We have developed a laser-based sensor for the detection of gas-phase elemental mercury, Hg(0). The instrument is capable of fast in situ measurement of Hg(0) at ambient levels. The RAMIX experiment intercompared atmospheric Hg measurement systems. We typically saw good agreement for measurements of Hg(0) but not for total oxidized mercury. Study of the diurnal variation of the atmospheric boundary layer (ABL) height is important for the knowledge of pollutant dispersion, crucial for all living beings. The most difficult part in the study of the diurnal variation is in identification of the stable boundary layer which occurs ~ 50% of times only and mostly during nighttime winter. Surface temperature and clouds directly affect the diurnal pattern of the ABL. Thus, stronger (weaker) diurnal variation found during pre-monsoon (winter). An exceptional strengthening of the middle atmospheric subtropical jet occurred without an apparent relationship with the tropospheric circulation. The analysis of this event demonstrated downward penetration of stratospheric influence to the troposphere: in the north polar region amplification of planetary wave occurred due to a deflection by the strong middle atmospheric subtropical jet, whereas in the tropics, increased tropopause temperature suppressed equatorial convective activity. OH reactivity was measured during a 1-month long campaign at a rural site in the North China Plain in 2014. OH reactivity measurements are compared to calculations using OH reactant measurements. Good agreement is found indicating that all important OH reactants were measured. In addition, the chemical OH budget is analyzed. In contrast to previous campaigns in China in 2006, no significant imbalance between OH production and destruction is found. In this study, we performed accurate OH measurements as well as selective HO2 and RO2 measurements at a rural site in North China Plain with state-of-the-art instruments newly developed. We confirmed the previous discovery on the enhancement of the OH in low NOx with which little O3 production was associated, and we found a missing RO2 source in high NOx which promoted higher O3 production. Our results are of vital importance for ozone abatement strategies currently under discussion for China. Natural atmospheric supersaturation is a norm rather than an exception at the surface of Dome C on the Antarctic Plateau. This is reported by hygrometers adapted to perform in extreme cold environments and avoid release of excess moisture before it is measured. One year of observation shows that atmospheric models with cold microphysics parameterizations designed for high altitude cirrus reproduce frequently but fail with the detailed statistics of supersaturation at the surface of Dome C.
We characterize primary and aged gaseous emissions from residential wood combustion using proton transfer reaction time-of-flight mass spectrometry. This approach allows for improved characterization, particularly of oxygenated gases, which are a considerable fraction of the total gaseous mass emitted during residential wood combustion. This study is the first thorough characterization of organic gases from this source and provides a benchmark for future studies. 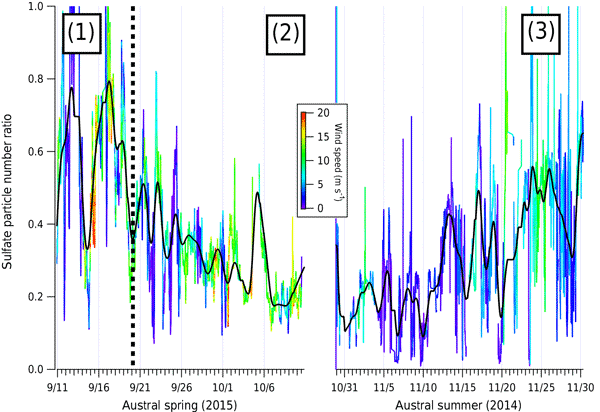 This study highlights the importance of taking into account a simultaneous use of land use, fire and precipitation for understanding the impacts of fires on the atmospheric loading and distribution of aerosols in Southeast Asia over both space and time. Also, it highlights that there are significant advantages of using 8-day and monthly average values (instead of daily data) in order to better quantify the magnitude and timing of the inter- and intra-annual variance of Southeast Asian fires.